Newspaper Rock: Wassegijig doesn't respect "redskins"
In Wassegijig and Yeagley Discuss Redskin, I continued my criticism of Redskin magazine's ethnic slur of a title. In response, Sheena Wassegijig, a writer for Redskin magazine, wrote again to defend herself and the publication. Follow the links if you want to read all the exchanges. Otherwise, here are her latest comments and my responses:this blog is still going on?This discussion was still going on as of July 30, 2008, if that's what you mean. You responded a month ago and now I'm responding to you. Meanwhile, this blog continues to analyze racism and stereotyping in the media--including Redskin magazine, with its ethnic slur of a title. I suspect it'll be going long after your magazine is defunct.and I see that my words are still being taken out of context to bind and blend them to your own. copy my comments WORD FOR WORD. do not portray me to bloggers by your ideals.Spare me your sophistry. I quoted three full paragraphs of your posting verbatim. If you don't like that, tough tootsies. I'm not giving you a choice in the matter. If you don't call "Why can't people just be supportive?" and "Thank you for mentioning me in your blog" examples of seeking Yeagley's support, that's your problem. Any rational person would agree that you were indeed seeking his support.I did not seek Yeagleys support. But I do appreciate it.Uh-huh, sure. Then why did you post a long message on Yeagley's website defending Redskin magazine so he could reply? What would you have done differently if you were seeking his support--write "I'm seeking your support"? Sounds like silly semantics to me. On to Redskin magazineYou being an adult man, I'm sure you have bought a far more explicit form of media to satisfy your needs.Wrong. I've never spent a cent on sexually explicit material and I never will. Unlike you, apparently, my "needs" don't include objectifying the women in our culture.Now...would I call my elder a redskin?You would if you believe the word isn't an ethnic slur. In fact, if it isn't, why would you hesitate? There's no reason not to say it if it's as harmless as you claim. Simply express the word to your elders just like you're expressing it to all the Indians you want to buy your magazine. In fact, your elders are potential readers, so show them the magazine. If you're too cowardly to call them "redskins" to their face, point to the title and say, "This is you, Grandfather and Grandmother. You're one of the redskins we're referring to. "come on rob, i have enough smarts to know that they have struggled and were tormented as children for being native and trying to take pride in thier culture was looked down upon.Yes, they were tormented because white people thought they were "dirty redskins" and called them that. And you're compounding the problem by repeating the epithet. As you did in Redskin Writer Ducks Challenge, you've proved my point. You're a hypocrite who doesn't believe what she's saying. As long as Redskin magazine helps you personally, you're happy to profit from people's pain. 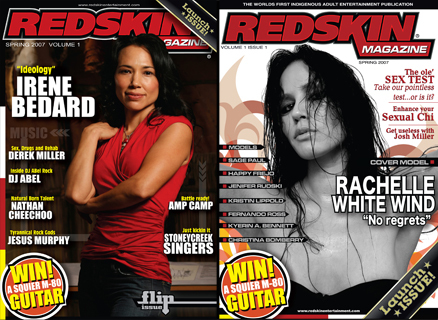 As long as your magazine title is "cool and hip," you don't care who it hurts.You have not taken the time to understand what Redskin Magazine is about and what it stands for or who it promotes. "Do you have a reading comprehension problem? How many times do I have to explain my position to you? I'm criticizing the magazine's title, not its content. Repeat: Title, not content. Say it with me so I know you can understand plain English. Prove you're not as obtuse as you seem. Yeagley the Indian applePosting that photo of yeagley and asking someone to define him based on his skin color. what is that, if not racist.Apparently you're totally unaware of the controversies surrounding Yeagley's heritage--the question of whether he has any Indian blood at all. And totally unaware of Yeagley's racist pronouncements against Indians. Incredibly, you're defending a supremacist who thinks Indians and blacks are inferior to whites. Wow.Also, you commented that what I had wrote about such things as humility, respect, truth, was fortune cookie wisdom?Yes, because it sounded like it came from a fortune cookie. Putting together a string of buzzwords isn't the same as making a coherent argument. If this is an example of your writing skill, no wonder no one has heard of Redskin magazine since its debut. With your bragging about your right to use the ethnic slur "Redskin" as your magazine title, I'd say you're lacking in humility and respect. With your omission of the history of the word "redskin" and Yeagley's anti-Indian prejudice, I'd say you're lacking in truthfulness. Next time, try addressing these points rather than ducking and dodging them. Then maybe you'll come slightly closer to achieving your Ojibway ideals.The 7 grandfather teachings. who are you to mock my cultural traditions and beliefs?I'm not mocking the traditional Ojibway teachings. I'm mocking your superficial regurgitation of them. Again, anyone who calls her peers "redskins" because it's "hip and cool" but won't call her elders "redskins" because she knows it's a slur is totally lacking in respect. Don't bother lecturing me on respect for Indians until you have as much of it as I do. Sheena weasels out againI am still content with ducking out of this challenge because what real challenge is it to me if I'm not the one with the problem?If you're so content, then by all means, keep ducking the questions you can't answer. Let this posting be the final one on your intellectual dishonesty. Namely, your claim that "redskin" isn't a slur even though you won't say it to your elders. While you're at it, stop telling us every six months how you don't care if I criticize you and your magazine. With your postings on my site and Yeagley's, you obviously do care. Here's a clue for you: Next time you want to convince us you're "content," do something other than posting a seventeen-paragraph response. Because that only makes you look desperately discontent. Any questions? If not, see you in a few months, when you again duck my questions and write a long response telling us how much they don't bother you. I find any words that were created to disempower and humuliate by putting people into groups based on stereo-typed racial identities offensive. Many claim that when those who have been oppressed by such words use and claim them that they free themselves from the tyranny of their meanings, but I believe that as long as those words float around their origins will be remembered, questioned and present. As long as those words are spoken, printed and recalled in every day life there will always be those who will find power in using them as racial slurs to hurt, box in and feel superior to people that can still find oppression in them. In my opinion it's best to pull them out of our vocabulary, bury them, say a prayer and move on. Hi Rob. I appreciate the topics that you cover as well as your perspective on things. I have been a fan of your "stereotype of the month" page for probably close to a decade. However, I often wonder why someone apparently so concerned that Native peoples be treated with proper respect would continually spend so much time writing about issues of Native identity, authenticity, and what we choose to call ourselves. Being that you are not Native yourself. In this case, my issue is not the magazine title "Redskin," but the propriety of you as a non-Native putting down Natives who choose for their own reasons to stand behind that name and use it however they want. Clearly, many well-known Natives have associated themselves with Redskin magazine; are you really ready to say they are all ignorant? And that you, as a non-Native, are a better judge of the word "Redskin" than Native people themselves? Do you not see the irony, hypocrisy, and assumed privilege on your part when you talk down to us Natives and try to "enlighten us" as to how our own grandparents were treated? Or anything about our traditions? I'm pretty sure that you've never been called a "tree n*gger" in your life. I'm curious why you are so invested in the issue of Native authenticity and your interpretation of political correctness to the point that you sometimes belittle, dismiss, break apart, and disrespect Native people's feedback to you on these very issues? Which concern US? You aren't Native. Not to say your voice isn't important or you shouldn't write about Native things, but you need to respect that our experiences are not yours. You don't know what its like to be us, and the WAY you write about some of these things is offensive to Natives, just by virtue of the fact that you are an outsider. I have been reading you for years, and watched you debate and rather arrogantly dismiss numerous individuals and tribes as inauthentic. So my comment is in response really to your pattern of writing in general, and not just this one particular blog entry. (I am Cherokee by way of Kentucky, and my husband is 1/2 blood Pequot and 1/4 blood Shinnecock, so I read your dismissal of Johnny Depp and the Pequots with much interest). However, I didn't realize until recently that you aren't NDN. I saw your picture, but just assumed all this time that you were Native until I recently read your bio. (I'm Cherokee, so I'm more open-minded about judging based on phenotype). I don't think its your place to decide who is or isn't Native. For you to do that, as a non-NDN, I think its just as destructive to us as some of the stereotypical images that you post up on "stereotype of the month". When you think that you are such an expert that you are more right about anything Native than Native peoples themselves.....well, that sounds a little like a "Hobby Indian" telling us how to sing our songs the "RIGHT way". Again, I very much appreciate reading your blog, and don't mean to insult you. I'm just asking you to give my words some serious thought. Beyond just picking them apart, piece by piece. Yes, don't expect a response right away because you know how incredibly busy I am. That is what you meant, isn't it? Or were you insinuating that I'm refusing to reply for some reason? The first possibility is the truth and the second is a stupid slander. I've said that no one is going to attack me personally in my own blog--even if it's an attack on my timeliness. Your choices are to address the issues, shut up and wait, or get lost...period. I'll leave your insinuations this time, but don't be surprised if I delete them next time. They're nothing but negative sniping--irrelevant to the substance of this debate. I said it before and I'll say it again: No one is going to clutter my blog with worthless personal attacks.